CSTS are proud to announce that their fourth confined space mobile training unit will be finally commissioned this week and head off to its first location. Each of our mobile units is approved by City and Guilds* and has something a little different to offer! *In order to achieve a City and Guilds qualification for confined space entry your delegates must be assessed in practical area approved by City and Guilds themselves. This can be problematic for companies wishing to train on their own sites. 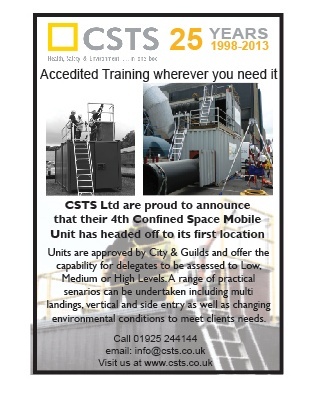 However, using one of the CSTS mobile confined space units means that wherever the training is carried out, delegates can be assessed to and achieve a City and Guilds qualification. For more information or to view our mobile training units enquire with our training team on 01925 244144 or info@csts.co.uk. Newer PostConfined Space Trained Operatives Wanted ! Older PostConfined Space Harness Offer!